Since Precision Prefinishing was founded in 1979, the focus of our marketing effort has been “liquid” system prefinished panels. The evolution of prefinishing techniques since then has been impressive. 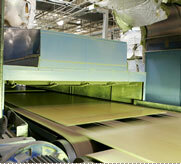 Early factory finishes were done with solvent-based inks, dyes, and coatings. Today, all liquid prefinishing at PPI employs only water based coatings, or 100% solid U.V. (Ultra Violet) systems, which contribute no harmful VOC’s (air pollutants), and present no environmental hazards in the disposition of wastes. PPI utilizes the best tested, and the newest advances in coatings and technology to provide our customers the most in value and performance. As with hand finishing surface preparation and multi-step application of coatings are the secrets to a rich, deep luster, and durable finish. At 1000 feet long, our finishing line is one of the largest and most advanced in North America. It has the length and number of computer controlled processing stations to apply virtually any finish system. The results are finished panels that will elicit favorable compliments from your customers, and deliver outstanding performance year after year. Substrates for prefinishing include hardwood plywood, softwood plywood, particleboard, MDF, MDO, and other composite panels in thicknesses from 1/10” thru 1 – 1/4”, widths up to 61” and lengths up to 144”.